There’s something very special about sitting by an open fire on a chilly night, logs crackling, coal sizzling, flames dancing brightly as the heat radiates out around the room. Maybe there’s a pre-historic memory of sitting in cave round a fire, protected from the sabre-toothed tiger prowling around outside. Maybe it’s just the warmth and cosiness, being full of life that makes us feel much more content than a radiator or electric heater. It’s even better if you’re on holiday and can really relax and enjoy it, knowing you’ve nothing more urgent to do than, keep it fed with fuel, top up your drink and maybe curl up with your loved one. 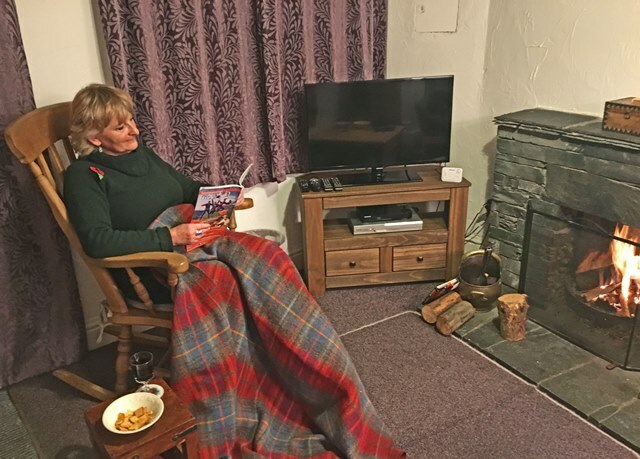 It’s one of the simple joys of life and for those of us who don’t have an open fire at home, staying in a holiday cottage with a fire is real treat. On a recent visit to the Lake District with Good Life Lake District Cottages, I stayed for a few days in Rose Cottage, Elterwater with a friend from college days. This delightful 2 bedroom self-catering accommodation is in the heart of the village, a hop, skip and a jump over the road from the Britannia Inn. With a comfortable lounge, well-equipped kitchen-dining room, a twin-bedded room and en-suite double bedroom, it had everything we needed. We very quickly made ourselves at home, having a cuppa and biscuit whilst working out what to do over the coming days. The advantage of staying in Elterwater in the Langdale Valley, is that you’ve got everything you need on the doorstep; charming accommodation, a traditional pub serving excellent food, a shop, a bowling green (OK a bit random but if you’re a bowls fan …), a bus service, stunning scenery and Herdwick Sheep roaming freely around the village. We decided to have dinner that evening at the Britannia Inn. I’ve eaten there lots of times and it’s always good food. If you want to eat in the dining room then make sure you book. Otherwise you can take potluck at getting a table in the bar or hall. We shared a table with a couple from Derbyshire who come up to the Lakes every year and absolutely love the Langdale Valley. There’s always an excellent array of local beers here, and the weekend we stayed the pub was hosting a beer festival so it was packed with beer lovers from around the UK and abroad. Having got heartily fed and warmed up, we returned to Rose Cottage to light our own fire. We’d arranged to have kindling and logs delivered and there were firelighters and matches above the fire-place. I used to live in a cottage with a wood burning stove, and grew up with coal fires, so I very much enjoyed trying out my latent pyromaniac skills. Very quickly we had a grand blaze burning away merrily. Pat produced a couple of glasses of wine and we settled down to enjoy the rest of the evening. Over the next couple of days, Pat and I explored the area, enjoying being in such glorious scenery. We went for a leisurely walk beside the river to Elter Water (Norse for Swan Lake), the nearby lake after which the village is named. It only takes about half an hour to I’d recently taken ownership of a brand new Ford Fiesta from local dealership Pye Motors, so took great pleasure in driving Pat around and showing off the car’s many features. We went up the Langdale Valley and had a drink in the Old Dungeon Ghyll, where another welcoming fire warmed up the many walkers making the most of a late autumn weather to get out on the fells. 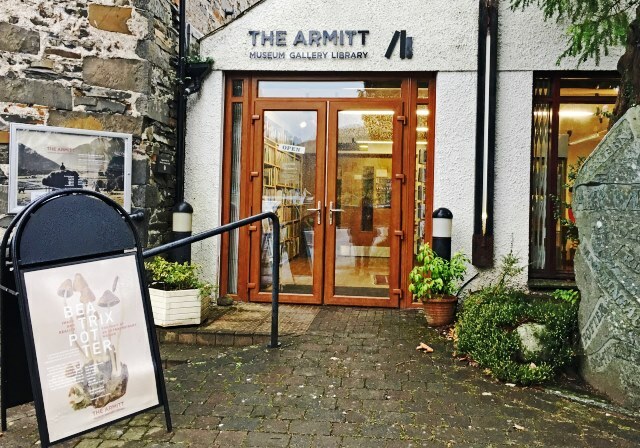 One wet afternoon we visited the quaint little Armitt Museum & Library in Ambleside. It has a permanent display of illustrations, writing and objects belonging to famous botanist, author and farmer Beatrix Potter. There’s also an excellent library and we saw an exhibition of paintings by German artist Kurt Schwitters, who lived in Ambleside for many years, and also Chapel Stile, down the road from Elterwater. We had a wonderful stay here and, without doubt, the best part was getting that fire lit each evening and rocking back and forth in front of its glowing warmth. We stayed at Rose Cottage as guests of Good Life Lake District Cottages. Many thanks to Natalie and the team for another very enjoyable break. They have plenty of very special Lake District places to stay throughout the year. Ask them about their properties with fires – but book early as they are very popular! 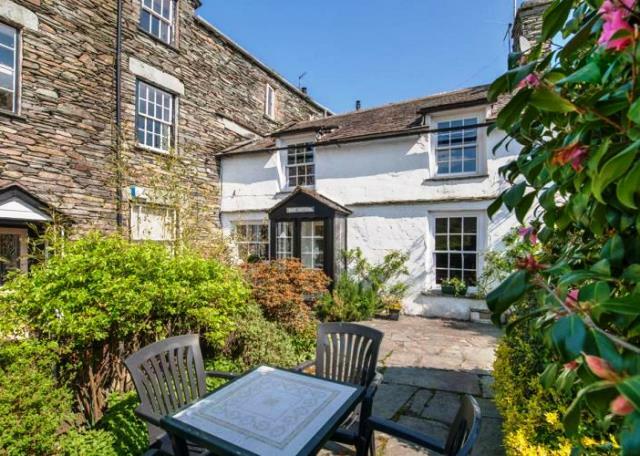 More lovely places I can recommend to stay with Good Life Lake District Cottages in this part of Cumbria. We know that part of the Lakes quite well and the Britannia Inn is great, isn’t it. It doesn’t matter what the weather is doing, the Lake District is a great place to visit 12 months of the year! This brought back memories. I stayed in Chapel Stile, near Elterwater one Christmas. It was magical – and it snowed heavily. 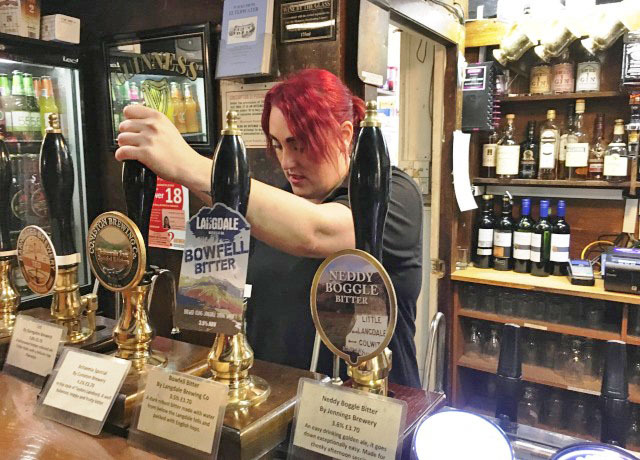 It was idyllic as the Britannia Inn and Wainright’s Inn were within a stone’s throw, with great food and drink. The local Co-op was open and sold evrything you could need despite the snow and even had pheasant in the freezer, which was welcome as we had unexpected guests on Boxing Day. 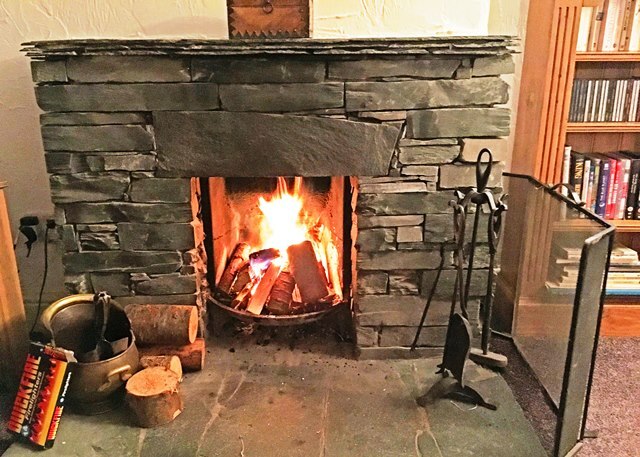 An wood-burning fire is a must when you are in a place like Elterwater. 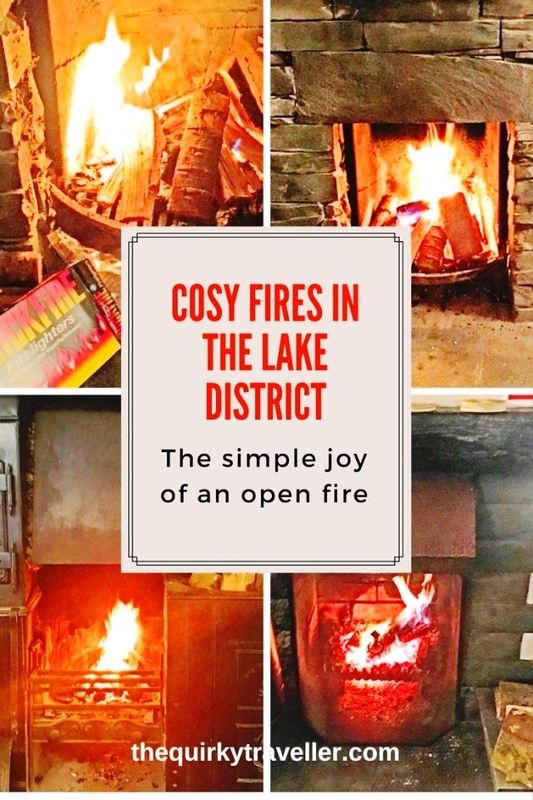 The smell of the wood smoke is in the air when you are returning from a bracing walk along the Langdale Valley, heading home to your own fire and cosy night in! I absolutely loved staying at Rose Cottage. Elterwater is a real gem and how wonderful to wake up every morning, to rustic charm and exceptional views. Each day offered new opportunities to discover the wonders of the Lakelland and at the end of the day, I looked forward to the fireside and the pure delight of total relaxation. Everything was to hand in the well equipped accommodation and it was a bonus for the little coffee shop and Britannia Inn to be so close. 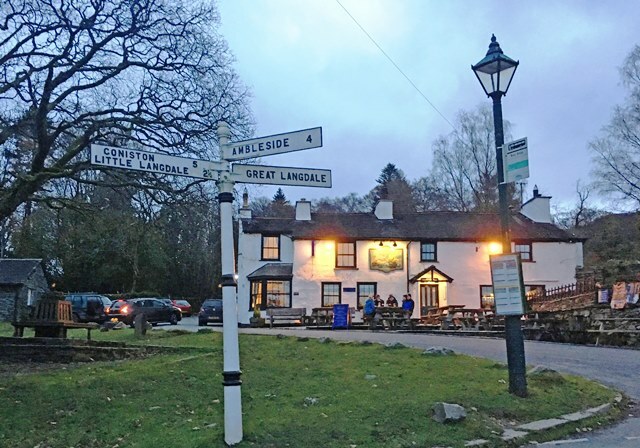 I was very impressed with Good Life Lake District Cottages and as I plan to enjoy another Cumbrian holiday in the new year, I am spoilt for choice as I see the variety of accommodation they offer. I would thoroughly recommend! That Christmas sounds perfect Liz. Great to get snow as well 🙂 The Co-op is a real asset; there’s also a cafe upstairs. I’m sure this area will be very popular again this winter. 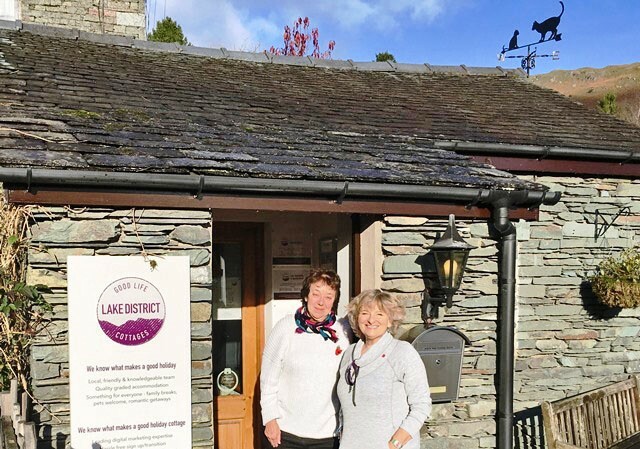 So glad you enjoyed your stay Pat and got to experience one of Good Life Lake District Cottages for yourself. As you know, I have stayed in many of their properties over the past few years and have never been disappointed. Each one is uniquely charming, but having an open fire is a big plus! Elterwater is a beautiful place to stay and Rose Cottage looks cosy. With the Britannia Inn so handy, what’s not to like? 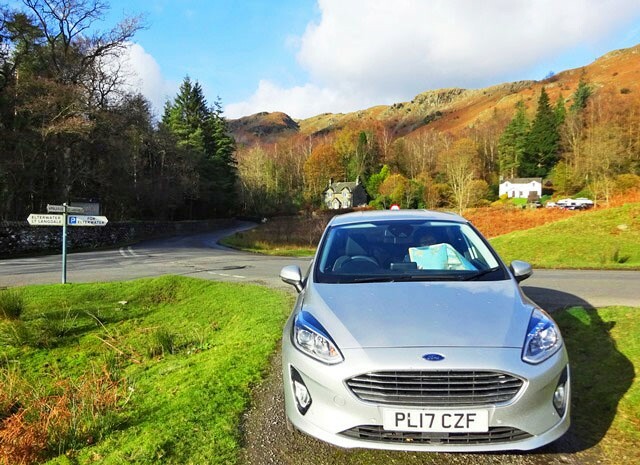 Thanks for a great blog post Zoe, we love our base in Elterwater and it’s characterful cottages in the heart of the Lake District. You can also visit us in our new office in Windermere town centre. Visit our website to see the full range of properties in our portfolio.